Being a geographer – sometimes environmental, sometimes marine, always human and often cosmological – looking at photographs from above provides incredible insight that can keep me captivated for hours. Of course – and with the sole exception of our Moon and the planet Mars – all photographs of other worlds are from an aerial perspective. But when I see photographs of the Earth as viewed from a few hundred kilometres up, I’m not bored or desensitised, not at all. I’m still in awe of what homo-sapiens have achieved in only a couple hundred-thousand years, and what we might be able to achieve in the next few. 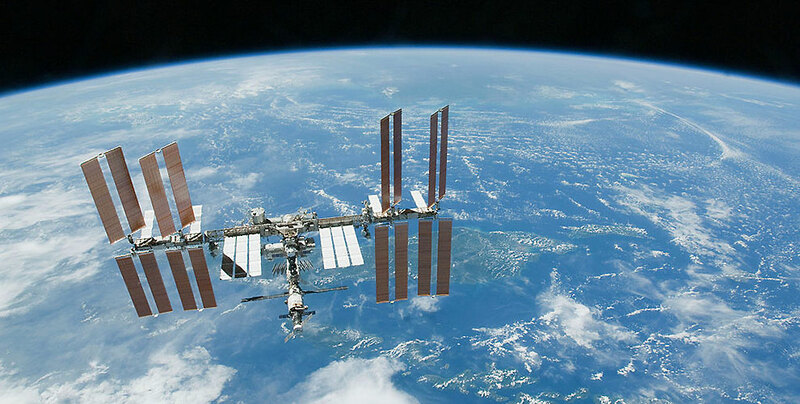 Looking at photographs of our rock taken from the International Space Station and other satellites, we are fortunate enough to be able to take a glance at Planet Earth from a close enough distance to see detail, but far enough to get the big picture. However, 408km up is still a fair few miles in my language and in poor weather, hard to make out the human footprint. 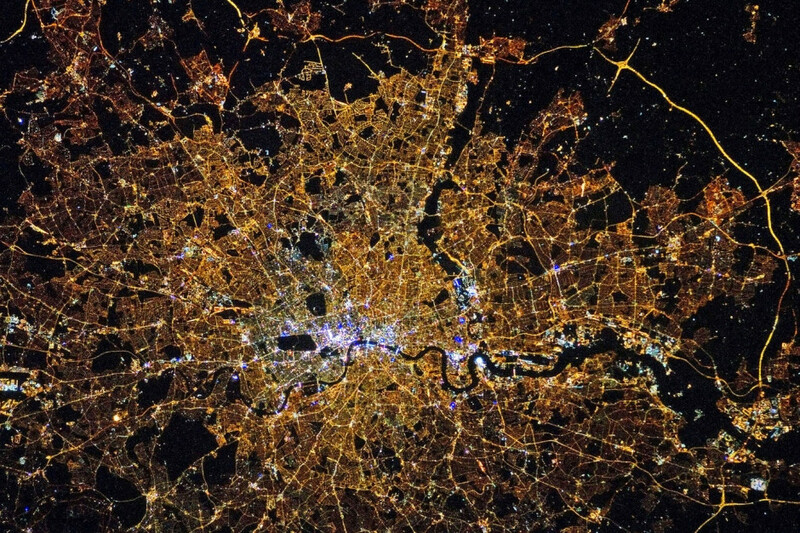 Great Britain, as seen by NASA’s Terra satellite in 2010. 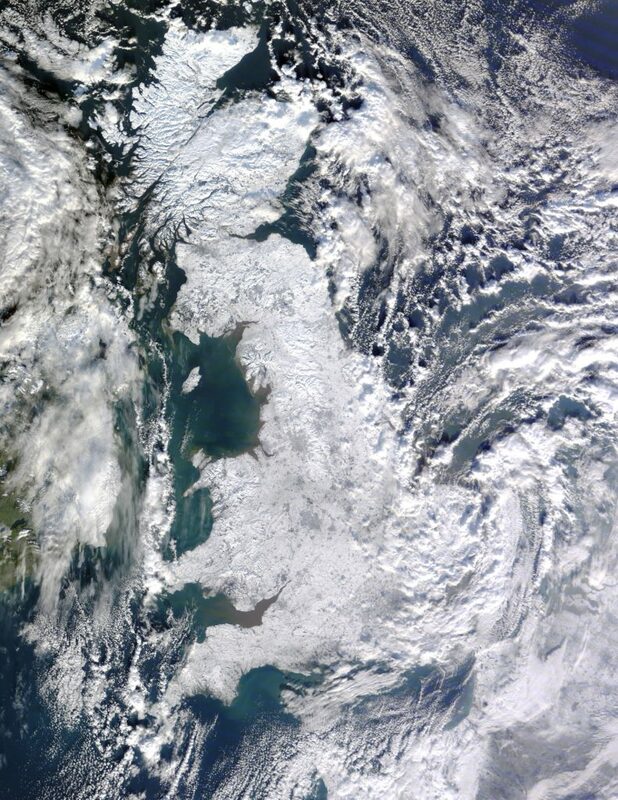 Yes, the cities are distinguishable by their slightly darker colour – it is relatively easy to spot the big congregations of human activity – but the fact Britain is covered in a blanket of snow does make it harder, impressive though it is. 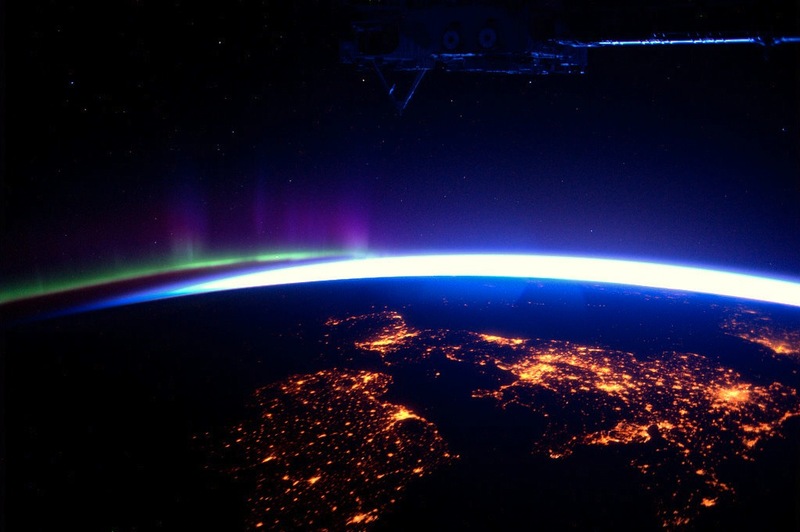 Great Britain & Ireland, from ISS. At night though, the country comes alive. London is obviously distinguishable in the south east, as is the Birmingham and Coventry conurbation and moving north, the Manchester and Leeds conurbation. Newcastle on the east coast and Glasgow and Edinburgh in Scotland. Being someone who prefers the peace and quiet of the countryside, it is clear I need to move to either Cornwall, north-west Wales, the Pennines or north Scotland. 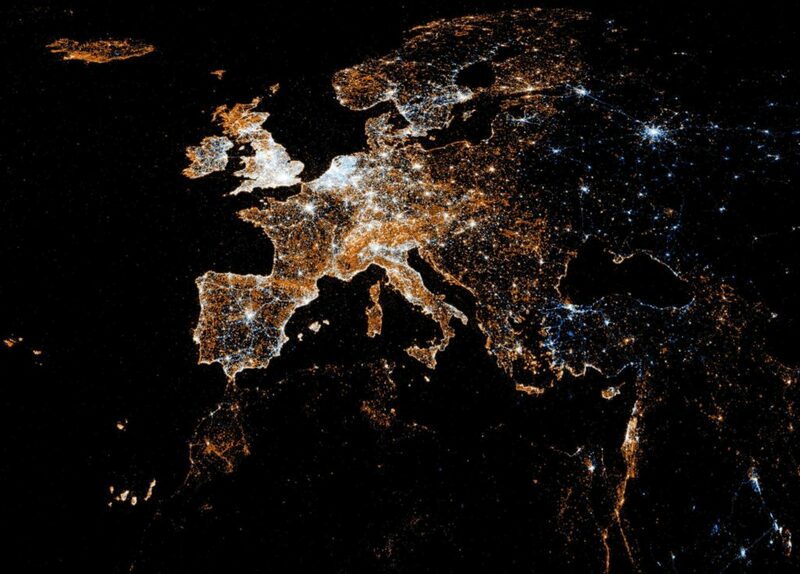 What is interesting about looking at Great Britain once we have all turned our lights on is that although we are still focusing ourselves on the coastal areas, as humans have always tended to do for sustenance, we are moving our population centres inwards. The Glasgow/Edinburgh conurbation is particularly interesting. Although both cities are situated at one of the country’s narrowist parts, they are still expanding into and filling the West Lothian and North Lanarkshire passage. Of course it is always pleasant to look at one’s own capital city, and London is quite spectacular from above and at night. Just look at the difference in light in the city centre, the white light in comparison to the yellow glow from the slightly more outer-reaches of the city. It is also oddly pleasing to see the M25 motorway wrapping the capital with its well-lit circular barrier of tarmac. Or is it just well-lit because the traffic is all congested again? To see what I mean about humans hugging the coast, just look at the Iberian Peninsula, Spain and Portugal. At about 8 o’clock you can see the bright lights of Lisbon, and moving around the coast to 7 and 6 o’clock you can clearly make out Faro and the Gulf of Cadiz. What is interesting here is how clear the border between Portugal and Spain is. 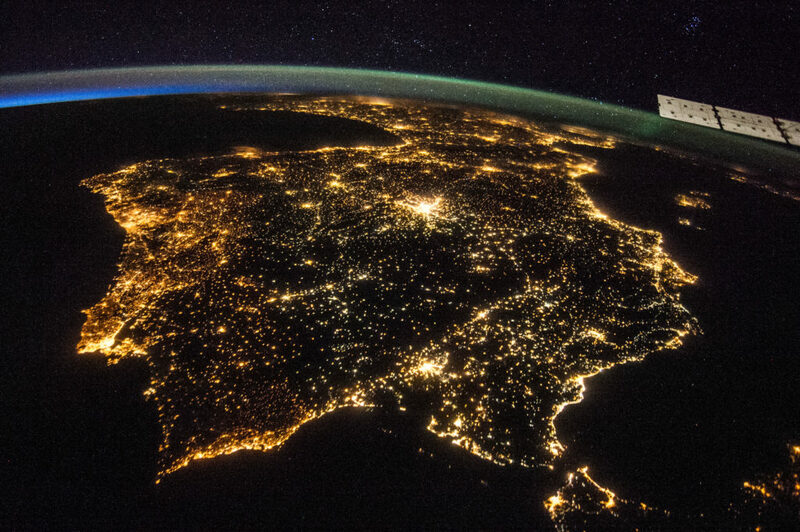 It’s like Spain just turned the lights out. Of course, what’s actually happening is the concentration of Portuguese in what is a relatively thin strip of land in comparison to the spread-out Spanish. It’s also interesting to note the transport links between Spain and Portugal. In the south there is clearly a main route that runs off the south coast of Portugal and into Spain, but follows the same trajectory of the Portuguese coast and heads for Seville (the E-1). Also visible is the E-90 that runs almost parallel out of Lisbon and heading east and in the north, (what I think is) the E-80. Because of course, where there are good transport links, there is population. Moving further around the south coast though and passing through the Strait of Gibraltar we can see the popular resorts of Marbella and Malaga, Murcia and Alicante and then winding around the coast to Barcelona, the glowing (although slightly blurred) city almost directly south-west of the solar panel of the ISS. The crazy shiny city in the middle is Spain’s capital, Madrid. Everywhere else, the Spanish couldn’t be bothered. And look closer at this tilted view of Europe: you can see Madrid, you can also just make out the glow of Paris, and you can even see the tiniest hint of London on the horizon. 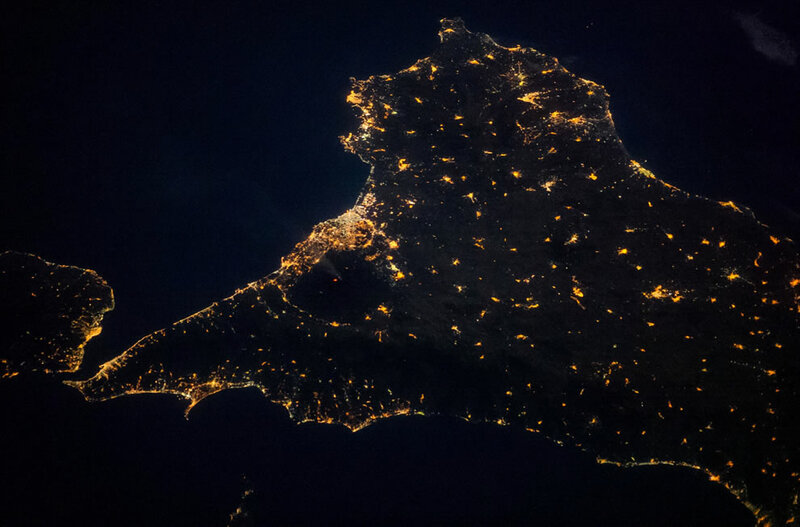 Looking at Sicily, the two major cities stand out with Palermo in the north-west and Catania on the east coast, but it is the closer view of Catania in the second photo that made me look twice. The city curls itself around the base of Mount Etna, one of Europe’s most active volcanoes and quite a dominant mark on Sicily’s landscape. But the red dot clearly visible in the middle of the dark circle that is Etna? It isn’t a superlatively bright light of human origin. 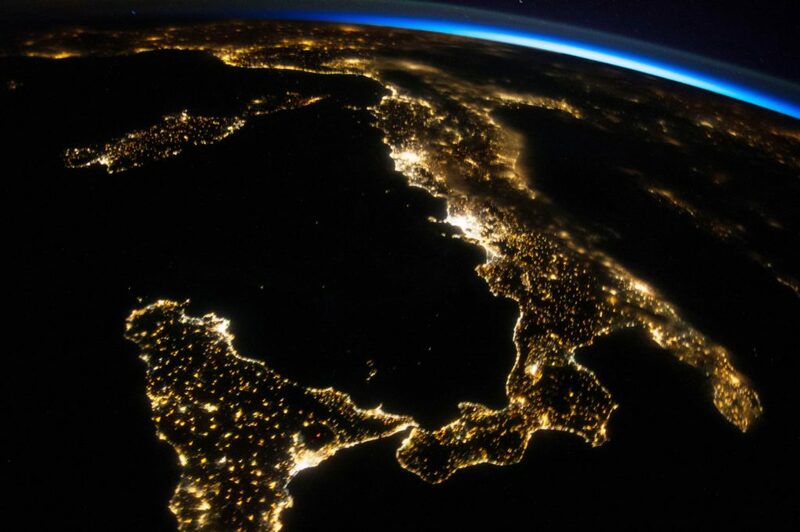 It is the glow of Etna’s crater. In fact, Etna is venting a little in this photo and is being illuminated by her molten glow. Another city view, this time Berlin. What is fascinating about Berlin is how visible the wall still is. Although it was torn down in late 1989, the fact that the East haven’t changed their yellow sodium vapour lamps to the whiter fluorescent lamps is a tell-tale sign of what was once a less unified country. I’m not going to discuss this image, I’d rather you do that in your own mind. I will give you a geographical sense of orientation though. 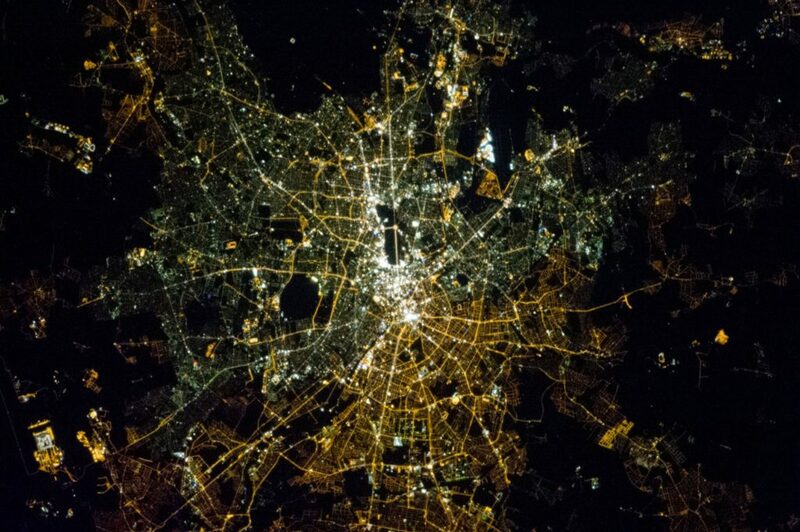 If you go to the top-right corner and then head south-west, the big fluorescent zit in the otherwise darkness is Moscow. I’m sure you can work out the borders from there. And that leaves a final view of Europe as a whole and a final note of disappointment that we are (likely) to be leaving the EU. It is disappointing for a whole plethora of reasons, but looking at this view one does stand out above all the others. We will no longer be sharing the electricity bill with our housemates. And it is quite clear that is not in our interest. It is equally impressive and equally saddening that it looks to be the UK that is blinding the heavens with light. To the Netherlands: I guess we’ll be forwarding the direct debit information in due course. Shame on us Britain. In my view it is quite a poor graphic of where we are. *I think the angle and curvature has confused me. The faux-curve in north-eastern Italy is Rimini and Ravenna, curving up to Venice and then going dark as it becomes rural and less inhabited. All images are credit to NASA. My new title is Cosmological Geographer.